This is your last weekend to enter the Giveaway for a Mother/Daughter Apron Set. This is so cute and would be perfect for all the Holiday Baking coming up! Head on over to Suzi Homemaker on FB and check out all her other fun bags and totes. She even has some Halloween Goodie Bags for your little Ghouls and Goblins to hold their Halloween Haul! This is my THIRD Review. How are you guys liking them? Have they been helpful? 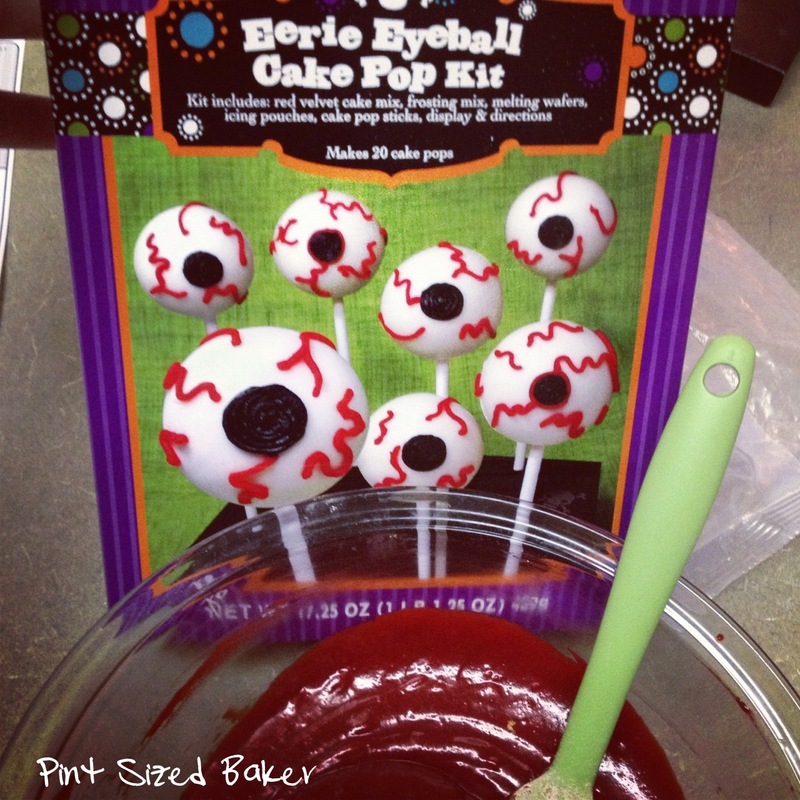 Have you decided to by the Pillsbury or Easy Bake Oven Cake Pop Kit based on my recommendation? 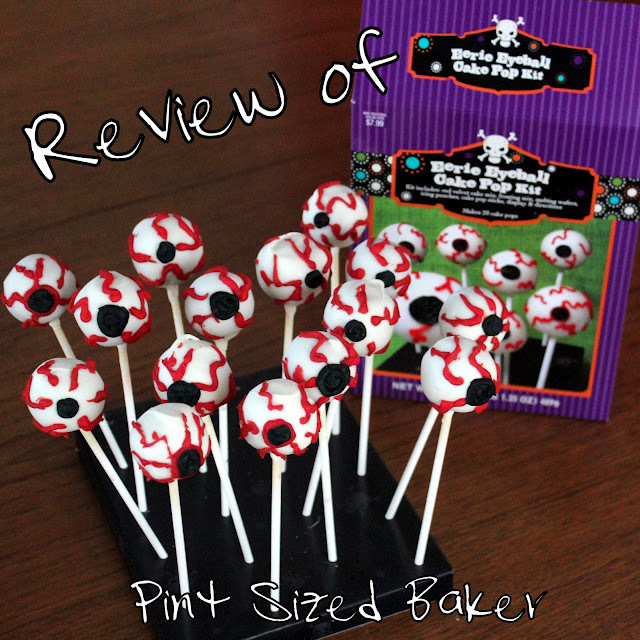 Just wondering if these reviews are worth their time or if you would like to see more Cake Pop tutorials. Today I am reviewing the Eerie Eyeball Cake Pop Kit sold by Target Stores. 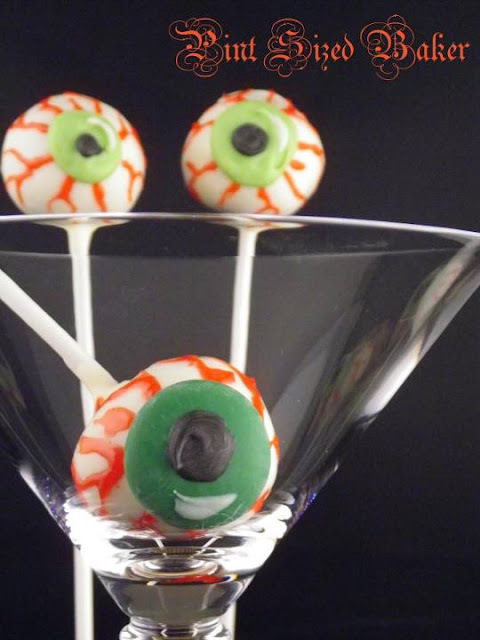 This Kit looks like a lot of fun for some Halloween Treats or for a Boy’s Birthday. Boy’s totally love the “gross” aspect of this! You need to bake the cake in an 8×8 pan and make your own frosting with butter. This is the first kit I’ve seen where you make your own buttercream frosting. I got 1/3 Cup of Vanilla Frosting following the directions. I really liked that the directions were to mix the cake and frosting with a paddle attachment in a mixing bowl. 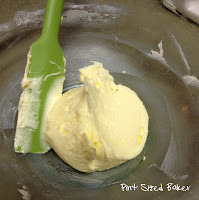 I always use my Kitchen Aid with paddle attachment to blend the cake and frosting together. 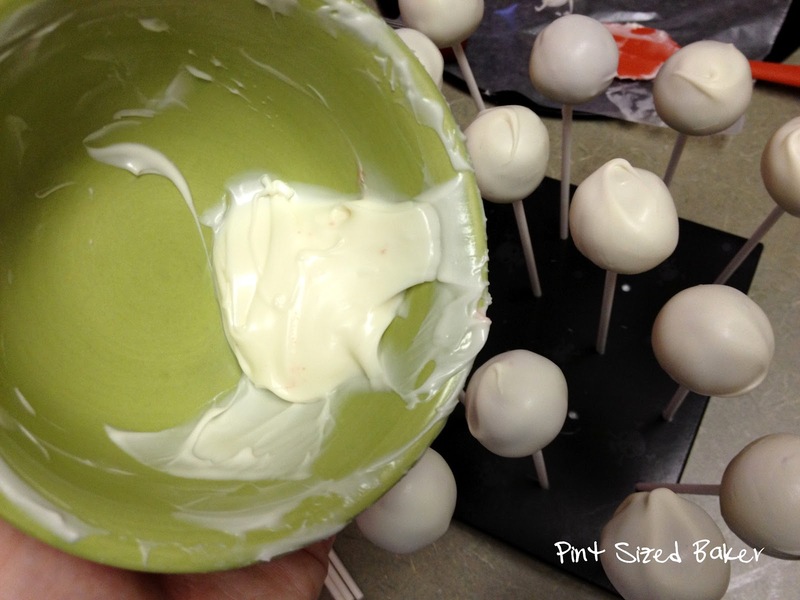 It really makes a difference in consistency of the cake pop batter. Using my cookie scoop, I measured out 22 cake pop balls, so I got a few extra. I decided it wasn’t worth it to spread out the two balls over the rest of the 20. The directions then told me to place the cake pops in the freezer. Hmmm… This I don’t do when I’m making my own cake pops, but that’s what the directions were, so I did it. Into the freezer of 20 minutes. Then out for sticks and dipping. I was worried about cracking the candy shell. 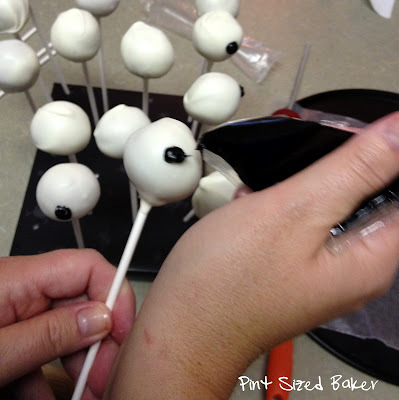 If you are new to cake pops, you should know that the candy shell can crack when the cake pop is too cold and it expands when it comes to room temperature after it’s been dipped. To avoid cracks, simply allow the cake balls to warm for 5 minutes on the counter prior to dipping. The candy melts melted in the microwave smoothly, however, I only had enough candy to dip 18 cake pops… Not too good when I had 22 pops. Finally, once all the pops were done, I could start turning them into eyeballs. I didn’t have any problem with the black frosting. I snipped off a small corner of the packet and made the pupils. No biggie. The problem was with the red frosting. Because I wanted skinny zig-zag lines, it was difficult to get the frosting to actually stick to the candy shell. I tried adding it with a toothpick, but it was too thick and it dried too quickly. My solution was to run the little packet under HOT water being careful not to let water in. This helped a lot, but I did have to do it a few times while adding the red. I also trimmed off the edges of the frosting packet. It stuck out and smudged some lines. I should have squeezed all of the frosting out and put it into a piping bag or sandwich baggie. Finally, this kit came with a great stand. I was pleased with the stand from the construction and durability. I’m keeping it for other projects. However, the holes are a tad bit close to each other, so you do need to lean the outside pops to the side to allow for enough room between pops. This is most important while drying the pops. Once they are dry, it’s not a big deal if they touch. + You get 20 pops for $8.00 (Check your local Target for sales). + Comes with a good stand. + Make your own Buttercream frosting. – No Baggies to pass out as favors at your party. Pick some up. – Red Frosting was thick and difficult to apply. 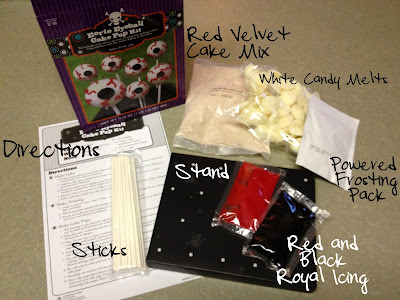 – Pouches of the Red and Black frosting was a bit difficult to use and make small lines. I recommend squeezing the frosting into a baggie and snipping off a tiny edge to make the details. 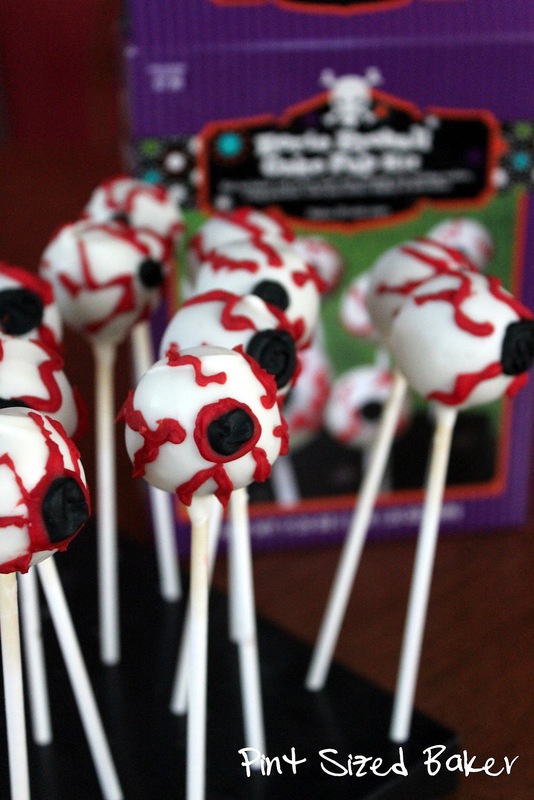 My overall opinion is this is a great cake pop kit for beginners. 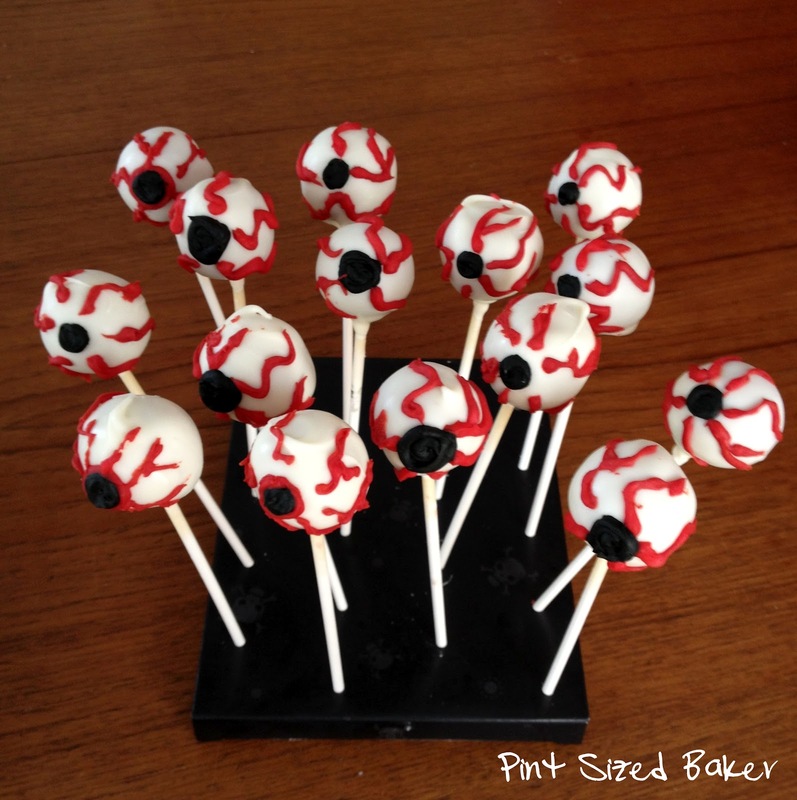 Your kids will have fun drawing the veins on the eyeballs and helping out. I have made eyeballs in the past and the fun thing with them is that they don’t have to “perfect”. So, even if you make “ugly” cake pops, it really just ups the gross factor of the eyeballs. To take these pops up a notch, get some green or blue candy melt discs and use those as an iris. Also, in place of the lollipop stick, use a plastic fork or skewer. I made these last year for Halloween. See more of my Halloween Cake Pops HERE! Haha these are cute! I'm stopping by target tomorrow morning! I found what I'm handing out for Halloween at work. Thanks for this review! Have fun! Don't forget to get a little extra candy melts. Thanks so much for the tutorial! Very helpful :o) You have amazing skills!!!!!! This is a very thorough and helpful review. Thanks for visiting. I followed the link, but did not see a linky party. Is there another post with the link? 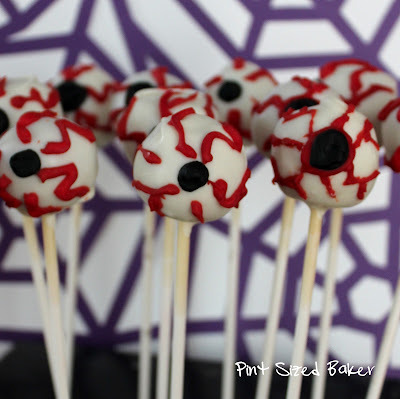 Creepy cool, I never have luck with cake pops. So now I just look jealously at everyone elses creations. Great job! Most people fail because of too much frosting. 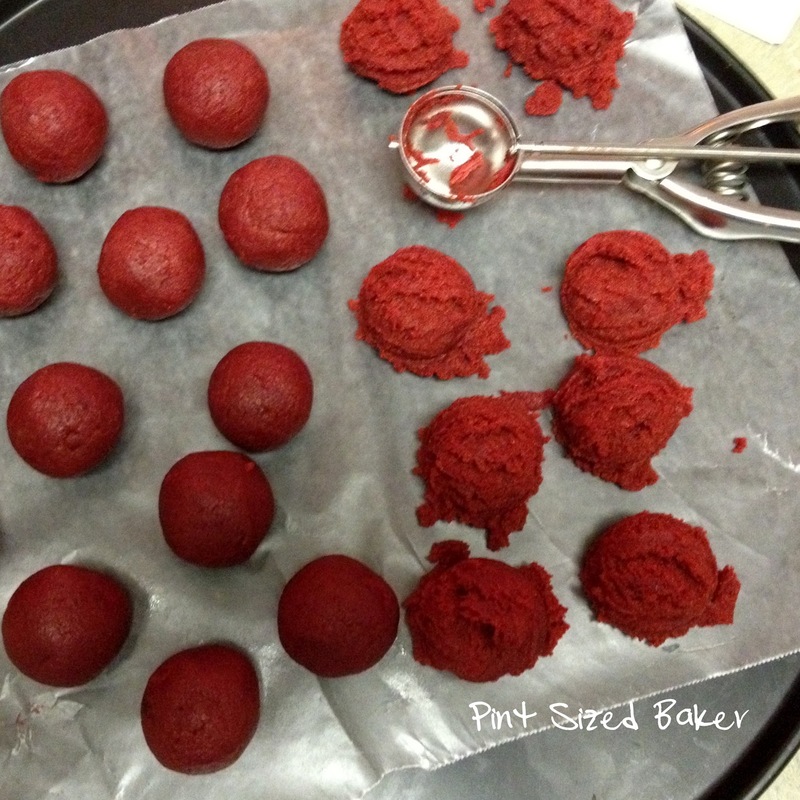 With these kits there isn't too much frosting to get mushy cake balls. For the $8, it's a fun way to try again. What a great idea for a Halloween party! CUTE!! I just pinned this review and tweeted about it. Thanks for linking it up to Say G'day Saturday. I will be featuring this post at my blog too! My daughter saw these and said they were the coolest thing ever:-) Good to know those kits need a little more chocolate though!!! What a great review. Saw these at the store and wondered how they would work out. Might try them now! I'm slightly confused by the directions in the box. Do you bake, roll the balls, then freeze? Or do you roll the balls, bake, then freeze? Help! !